WHO I FISHED WITH: This morning I fished with a crew from the First Baptist Church of Round Rock, including Tim Darst, youth pastor, Mark Barber, deacon and small business owner, and Clark Shubert, a self-described “support guy” and husband of the church’s children’s ministry leader. 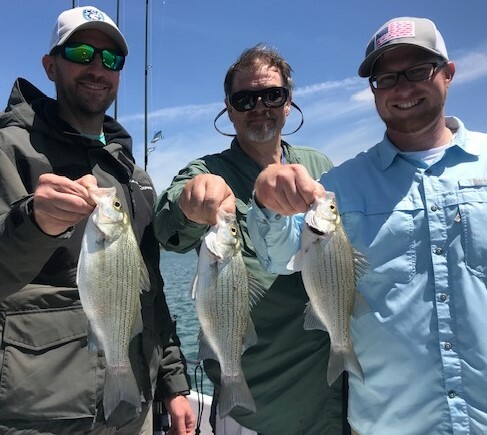 PHOTO CAPTION: From left: Mark Barker, Clark Shubert, and Tim Darst, all of First Baptist Church of Round Rock, with a few of the white bass we worked hard for this morning. 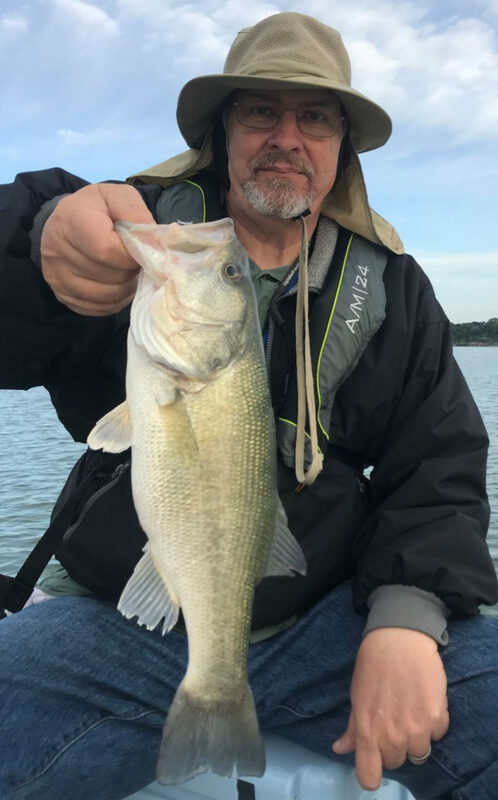 PHOTO CAPTION: Clark Shubert with a nice largemouth taken under low light conditions on a blade bait in about 10 feet of water. HOW WE FISHED: Tim, who has kids aged 1, 5, and 8, had to get them started on their way this Monday and couldn’t join us until about 8:20a, so, I met up with Mark and Clark at 7:00 so we could shoot for some shallow fish under low light conditions. Prior to Tim’s arrival, we landed 14 fish including 1 smallmouth buffalo, 1 largemouth, and 12 white bass, with a few other white bass missed. After we added Tim to the crew, we tried to milk a little more out of the white bass up shallow, but only added 2 more fish before the brightening and clearing skies killed that shallow bite. From that point on we found fish only in deeper water. We spent much of the following 2 hours just searching for fish to fish for. We found on area, adjacent to the river channel with abundant bait and scattered, suspended fish. We made use of the Garmin LiveScope technology to sharpshoot these suspended fish using 3/8 oz. Hazy Eye Slabs equipped with stinger hooks. We made two “short hops” in this area landing about a half dozen white bass at each spot before moving on, only to return here because I could not find other areas with a combination of fish and bait which made me confident enough to stop and fish. When we returned, we put another half-dozen fish in the boat before moving one final time at around 11:30. When we moved we found fish on a gentle slope on the side of an underwater draw in about 32 feet of water. The more we fished and caught, the more fired up the fish got, allowing for a “smoking” tactic to be used on several occasions when the fish got really competitive and fired up. We wound up catching about 3 dozen fish at this location as the fellows went through the learning curve of properly responding to what they were seeing on sonar. We wrapped up the morning with 67 fish including 1 smallmouth buffalo, 1 largemouth, 1 white crappie, and 64 white bass in the 1 and 2 year classes. OBSERVATIONS: No shad spawning observed. Fishing improved with wind velocity. 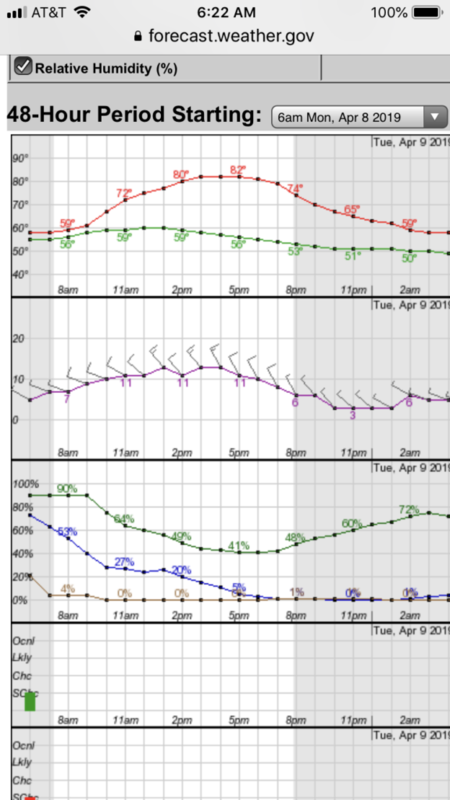 Wind Speed & Direction: W4 at trip’s start, turning slowly NW and slowing increasing up to NW12 by trip’s end. Sky Conditions: 70% grey cloud cover for the first 90 minutes, then rapidly clearing to <10% white cloud cover as the NW wind began and ramped up.